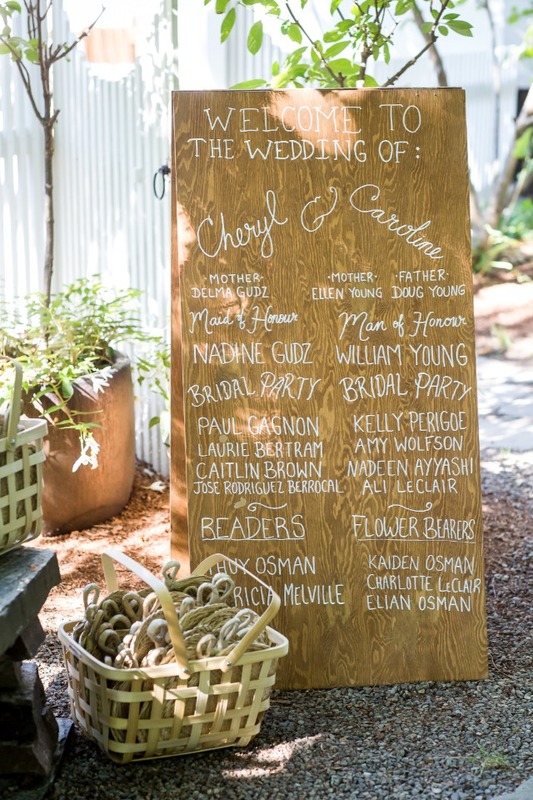 Many of our couples want their weddings to be seen as unique and specifically them. 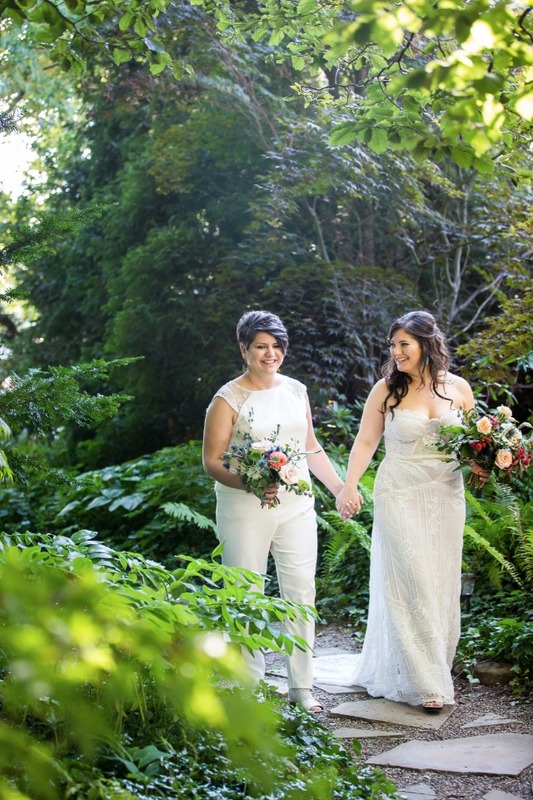 Cheryl and Caroline's Southwestern secret garden meets Niagara Falls wedding is definitely a theme we have yet to come across. 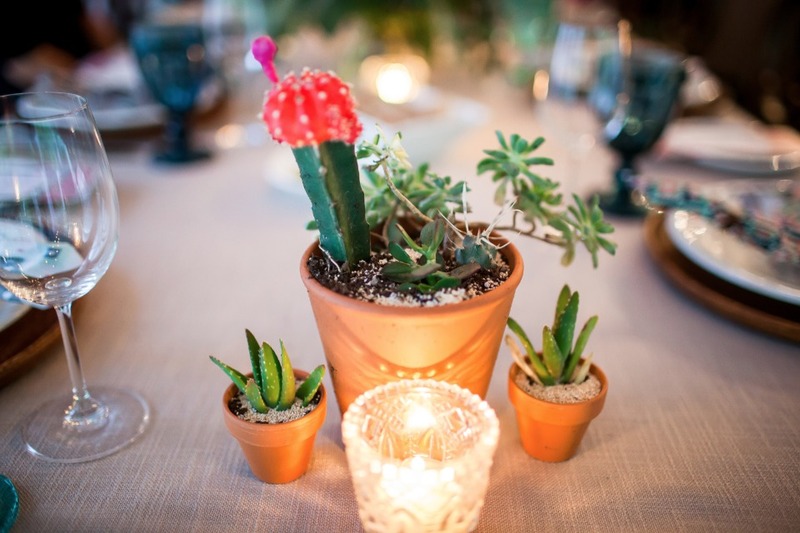 This beautiful day celebrates Caroline's love of her Southwestern desert roots with plenty of cacti and succulents and a funky southwestern print thrown into the mix while it also keeps Cheryl's Canadian home in mind with an after party feast of poutine! 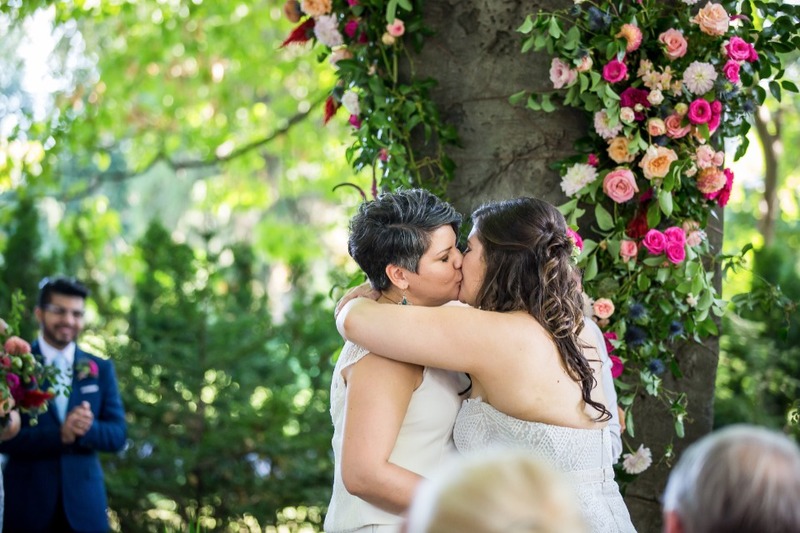 Seriously, if you are looking for a gold star example of a wedding that represents you and your honey, this is it! 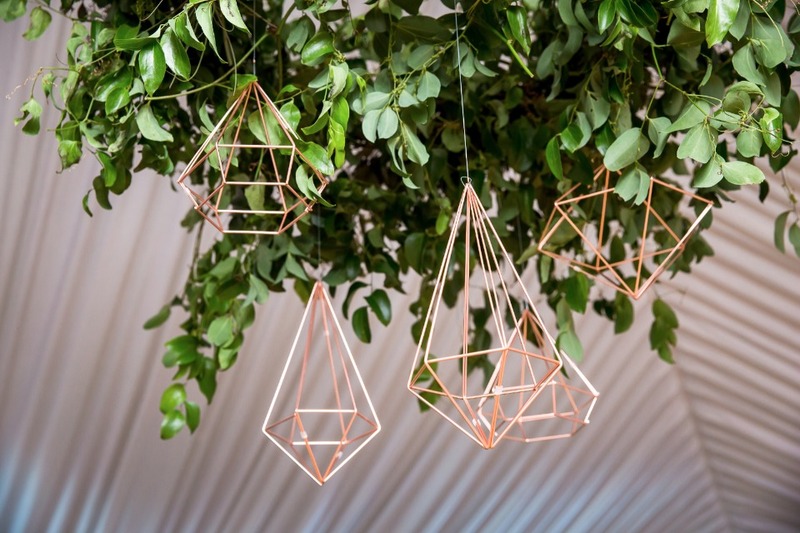 Keep scrolling to find more garden party meets modern desert chic style ideas! 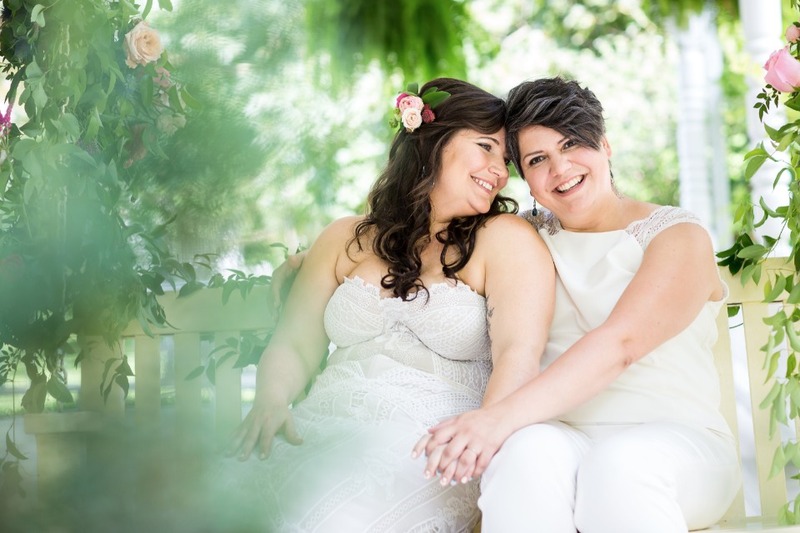 You can also see more of Cheryl and Caroline's big day by visiting the full gallery. We have plenty more photos to share with you there thanks to the talented Catherine Farquharson, Documentographer. From Lustre Events: This couple. Energetic, interesting, compassionate, and completely fully in love. Caroline is originally from Arizona, Cheryl is from Manitoba. 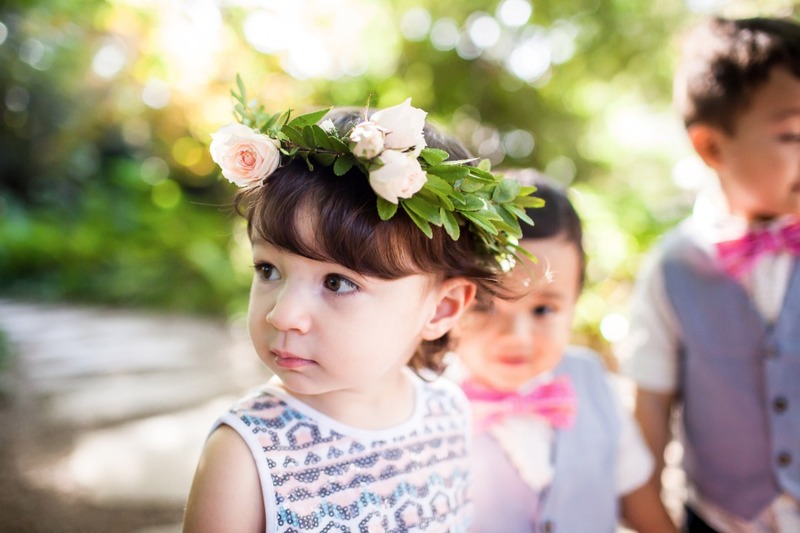 They have a very cultured crew of family and friends who live and travel abroad. 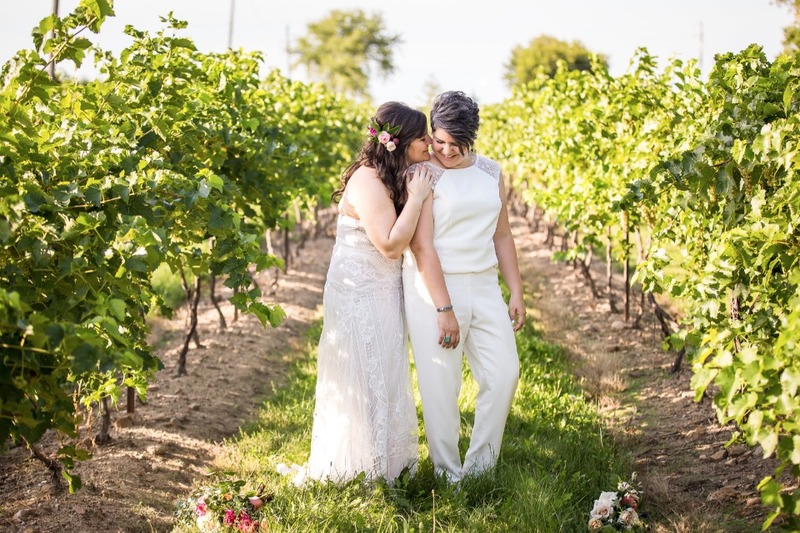 So it was music to our ears when they expressed they wanted their special day to reflect Caroline's loving nostalgia to the desert where she grew up, Cheryl's Peruvian roots, their Canadian connection, and most certainly the local Niagara magic where the wedding took place. 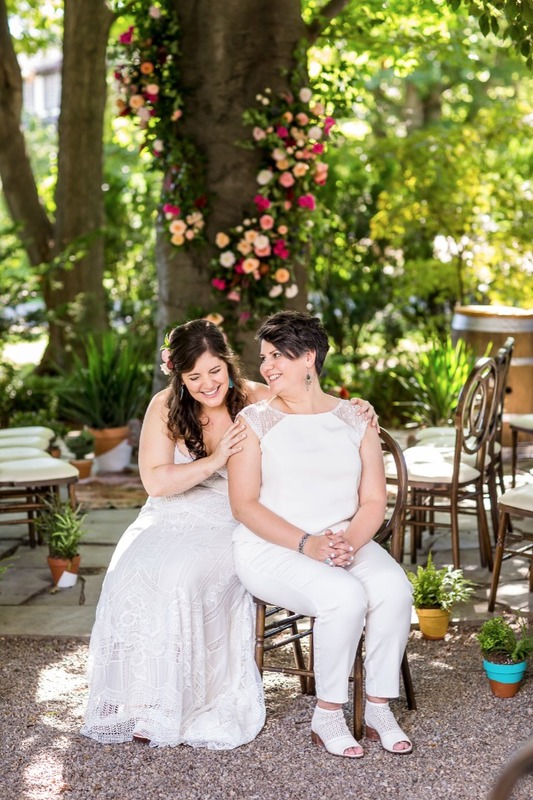 The wedding took place at The Grand Victorian bed and breakfast located on a picturesque winery. The historic home is glorious with it's green shudders and growing ferns. 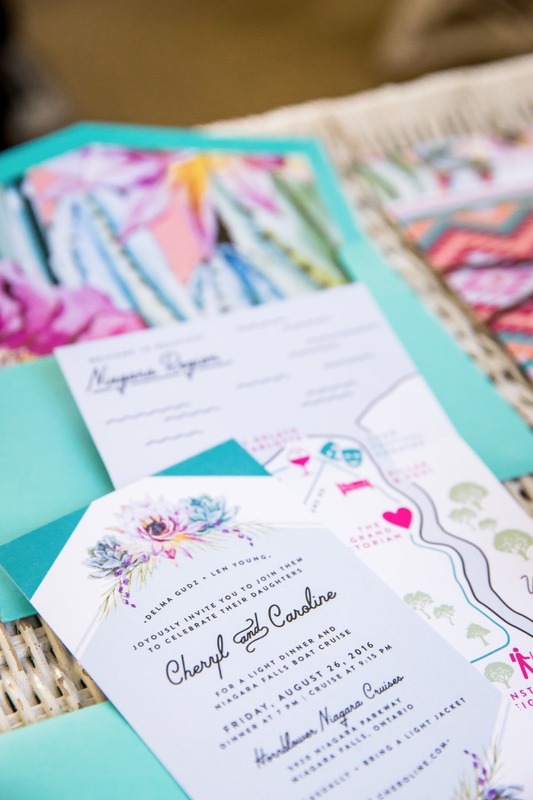 We wanted to express their joy and depth with lots of pattern, colour and celebration. 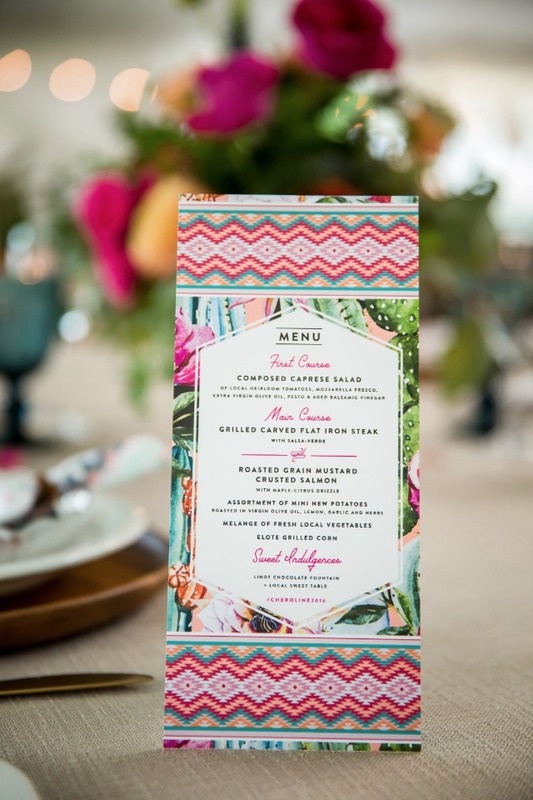 Bright fuchsia and coral were highlighted against brilliant blue and turquoise. 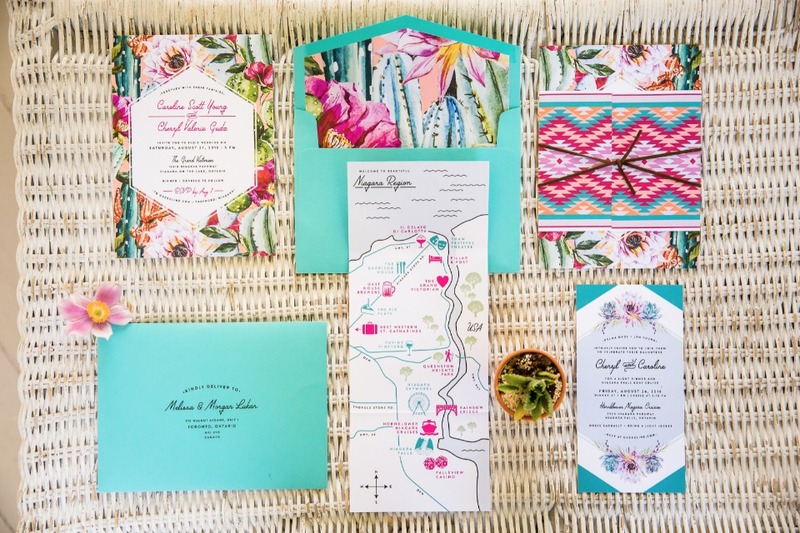 We mixed both botanical prints with southwestern style patterns for a bold pop in all the stationery. Both stunning ladies had subtle southwestern vibes in their impressive ensembles. 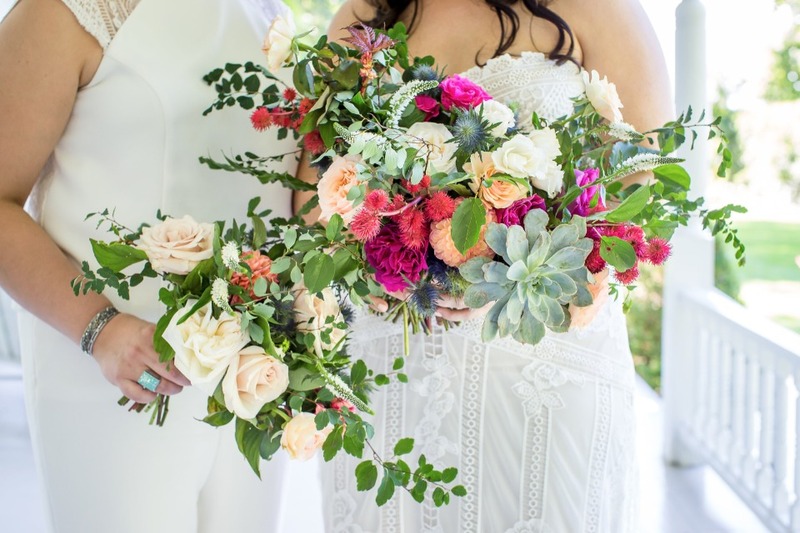 Really take a moment to appreciate those bouquets!! 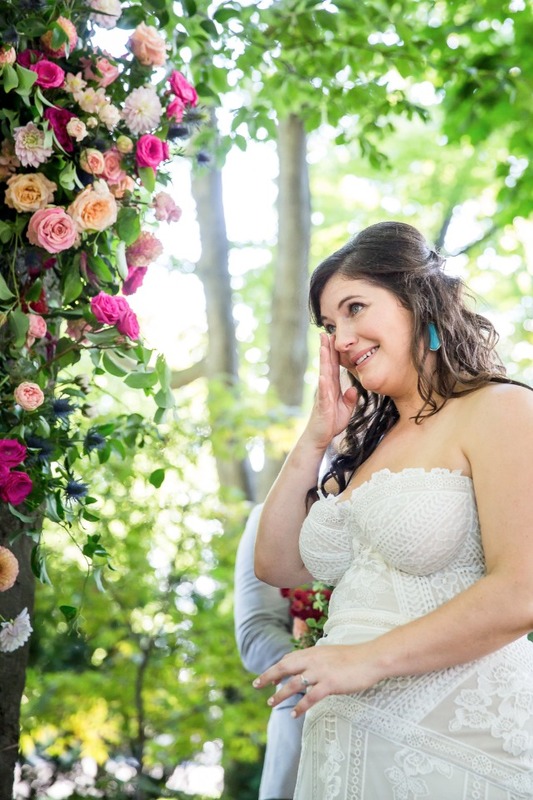 From Caroline: My dress was the Fox Gown by Rue de Seine. Cheryl's outfit was custom by Catherine Langlois. 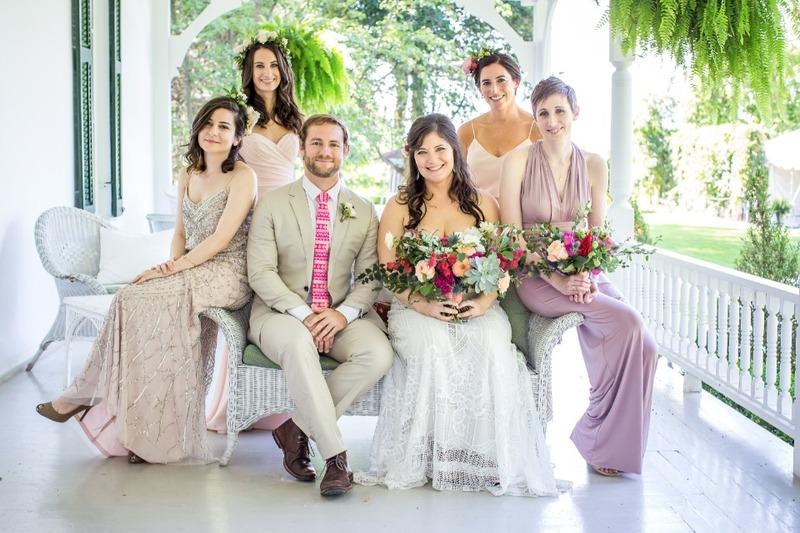 Our bridal party chose their own outfits, Cheryl's side in greens and blues, and my side in pinks & champagnes. The men's ties were custom by Knotty Tie. 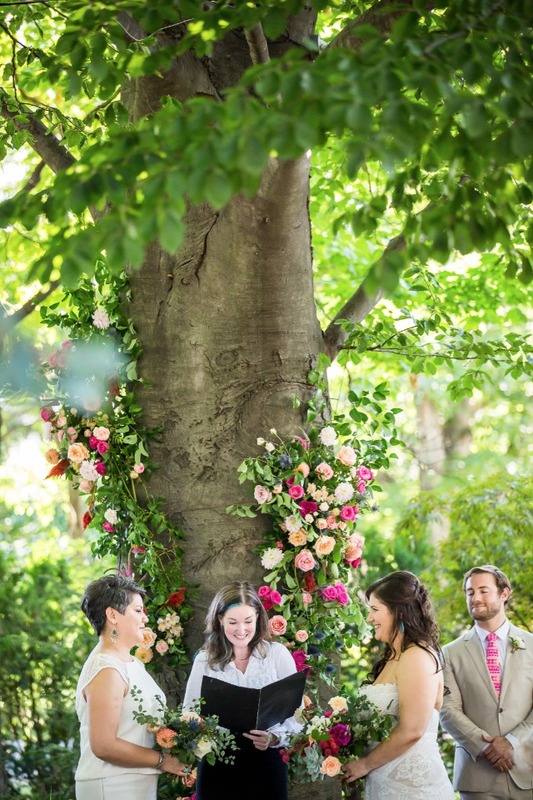 From Lustre Events: The ceremony took place under the most majestic and serene tree. 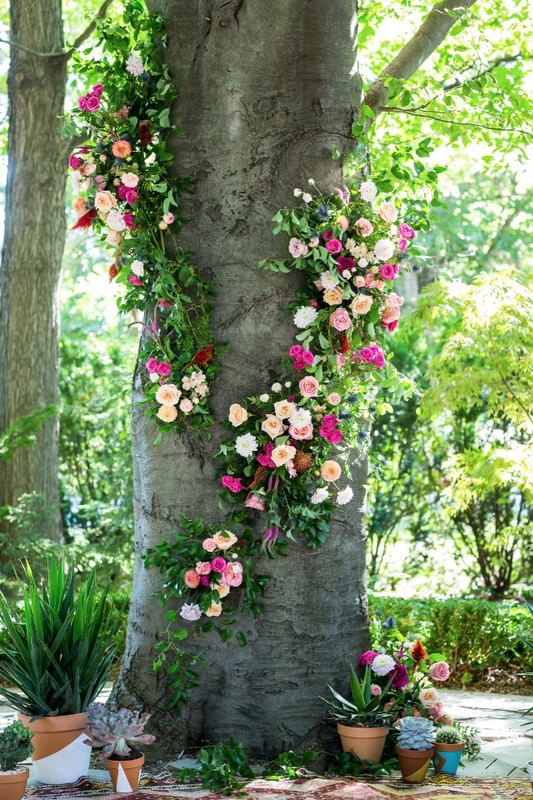 The bright, textured blooms covered it's trunk with so much beauty, you almost wanted to whisper while under the canopy of branches. 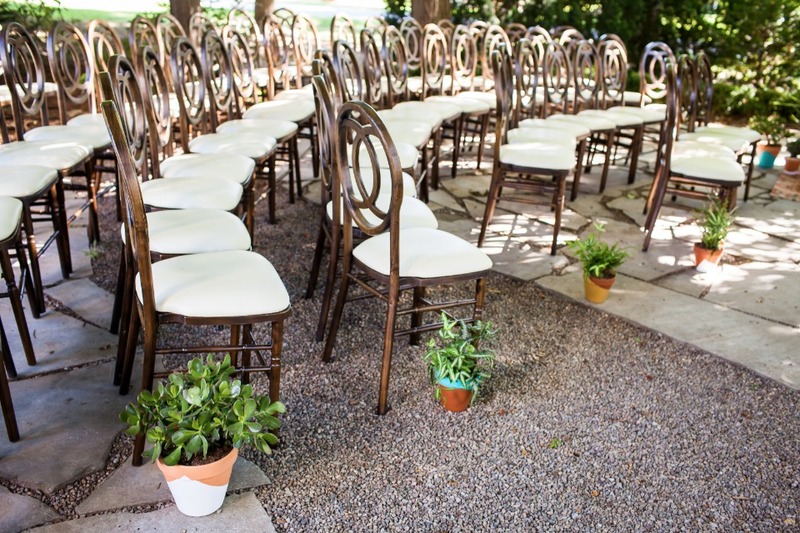 The setting was complete with a gorgeous kilim rug, and pots of cacti both of the brides hand painted. 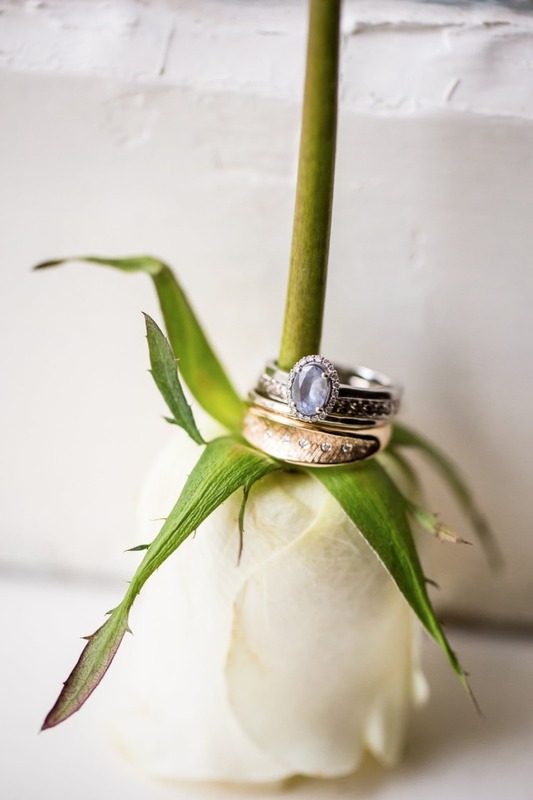 From Caroline: We forgot to bring our rings to the ceremony, and didn't assign the duty to anyone else. 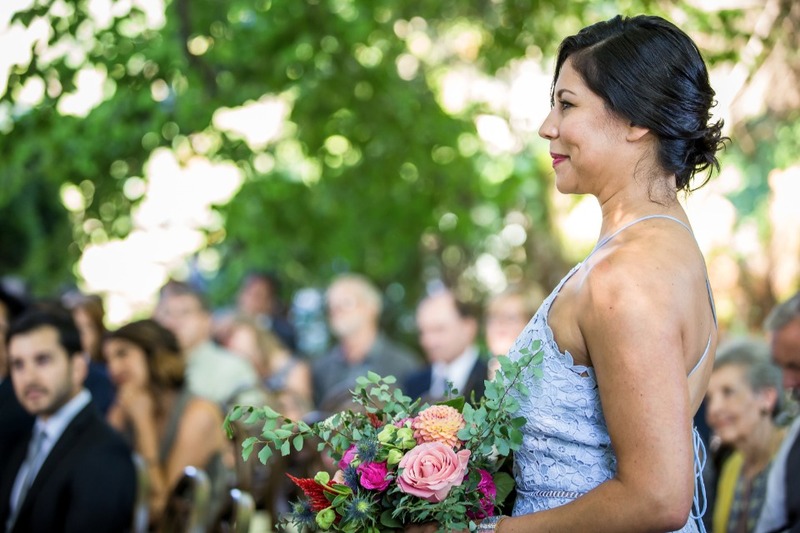 Our officiant was great, and went with the flow. 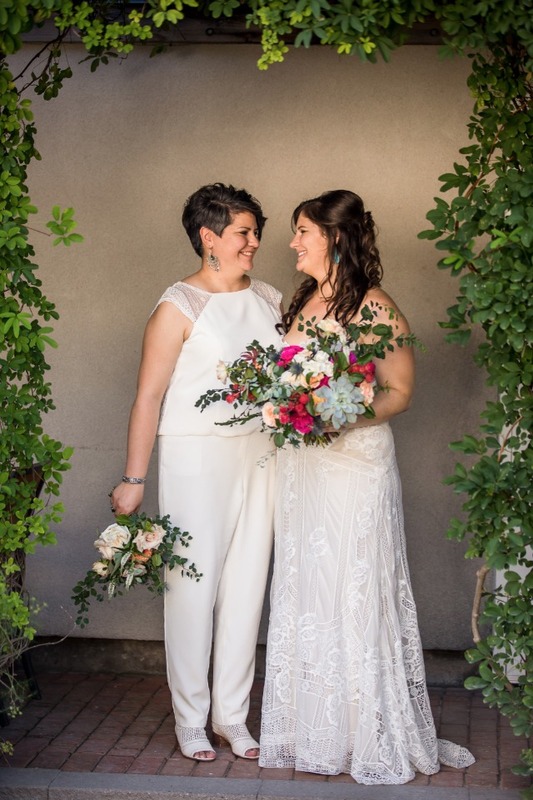 We ended up using our engagement rings for the ceremony and went and got our wedding rings immediately after and had a special moment alone together before joining the party. 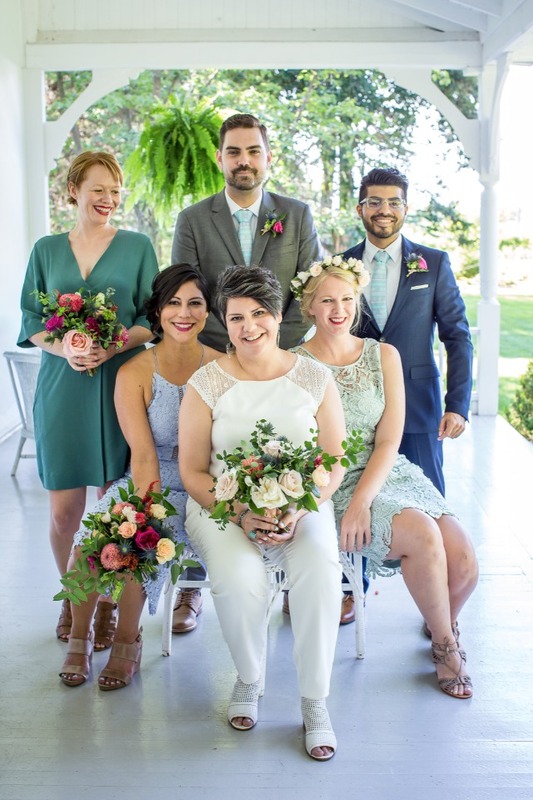 Despite the hiccup, it led to a moment of levity in the ceremony that many guests said was their favorite part! 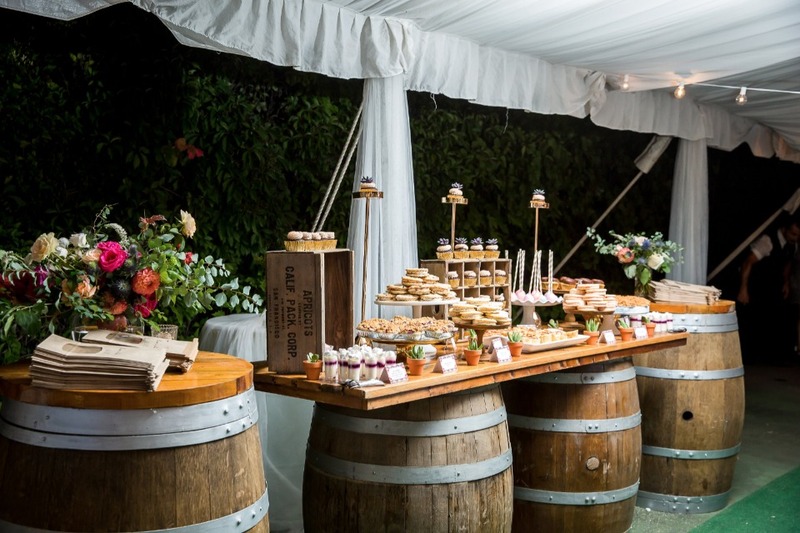 From Lustre Events: After the heartfelt ceremony guests gathered on the front lawn to enjoy a selection of signature cocktails including a Pisco Sour. 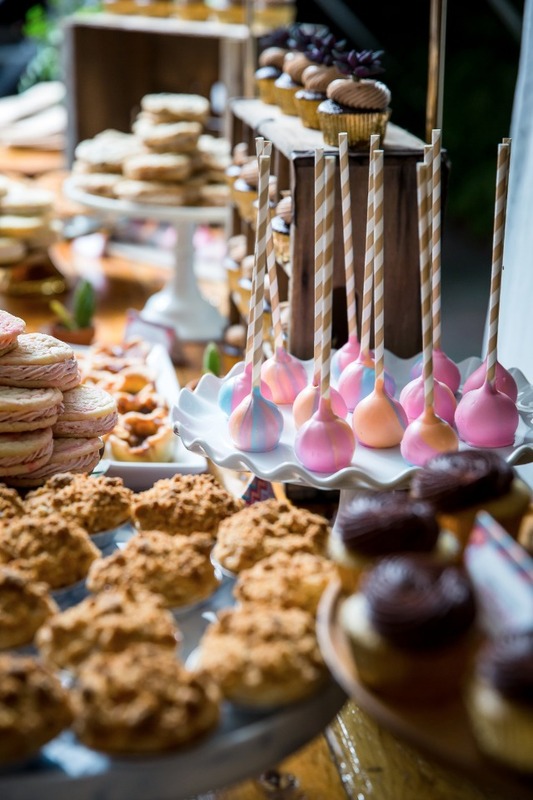 An artisan charcuterie and cheese spread was accompanied by a fresh oyster bar, both of which were devoured. A fantastic canvas tent was the perfect chill-out area to enjoy a nice drink. All of the furniture in the little lounge tent is from Cheryl's vintage store she owns in downtown Toronto. Such a personal touch. 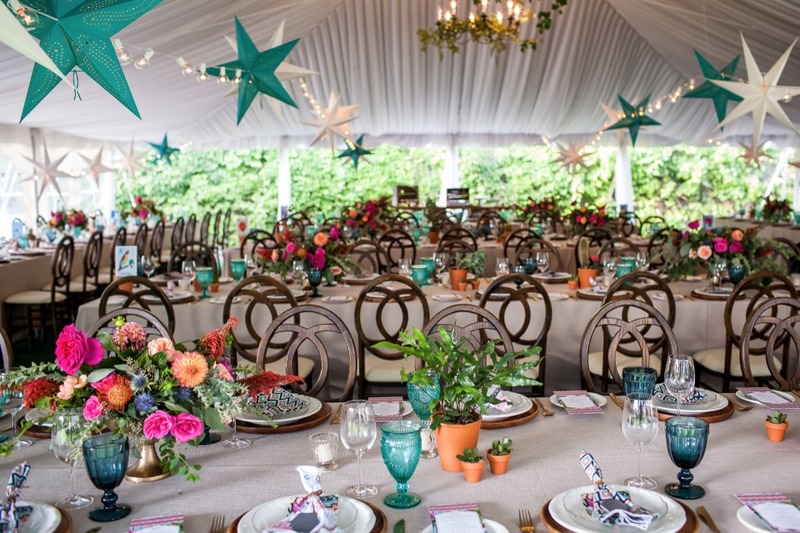 From Lustre Events: Dinner took place under the most magical of tents. 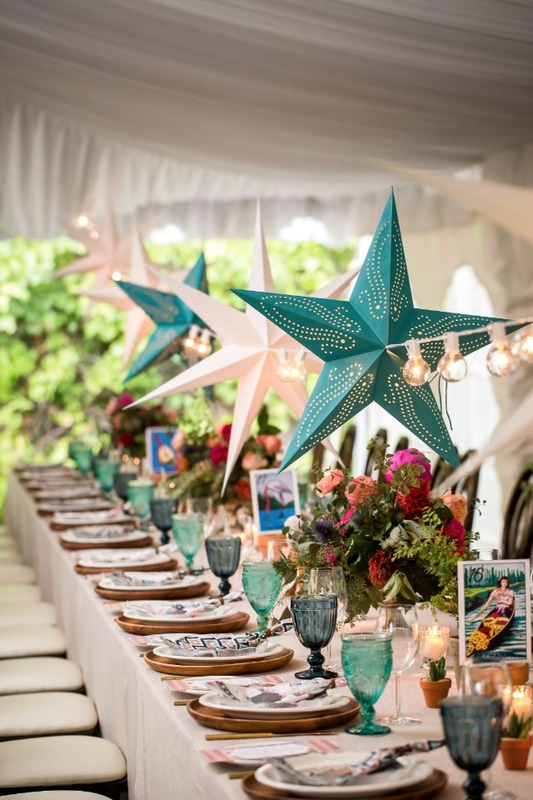 The ceiling was strung with star lanterns and cafe lights. 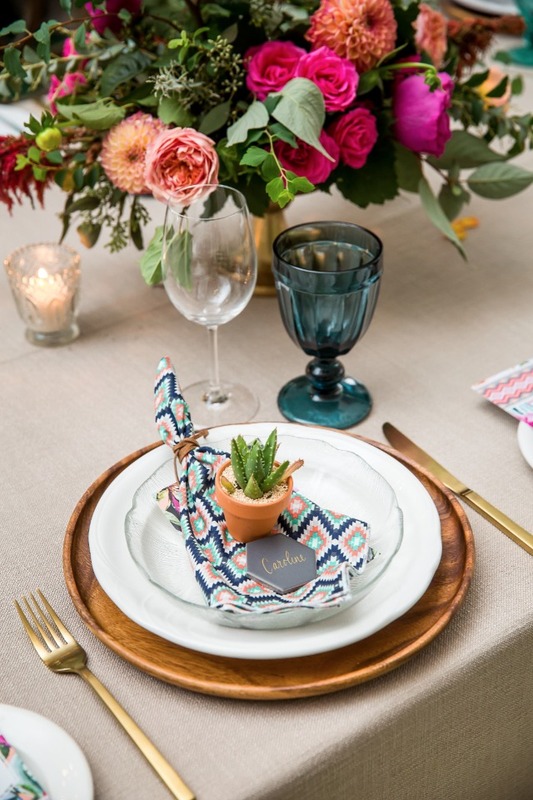 Each place setting had a bamboo plate, custom made desert inspired napkins tied with leather, a hand lettered tile place card, beautiful blue goblets, and most importantly a personal written note to each guest. 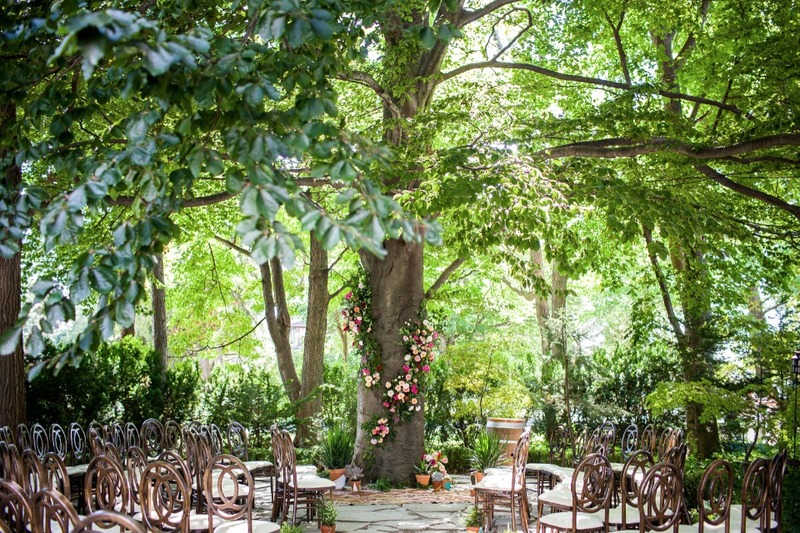 The florals on the tables were phenomenal. Rich with texture that tells many different stories. 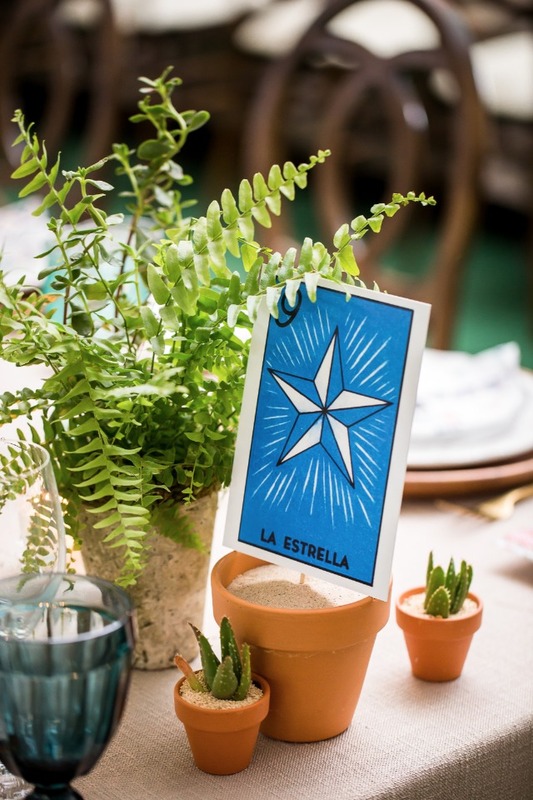 Terra cotta pots lined the tables to incorporate extra cactus and the Loteria playing card table numbers. 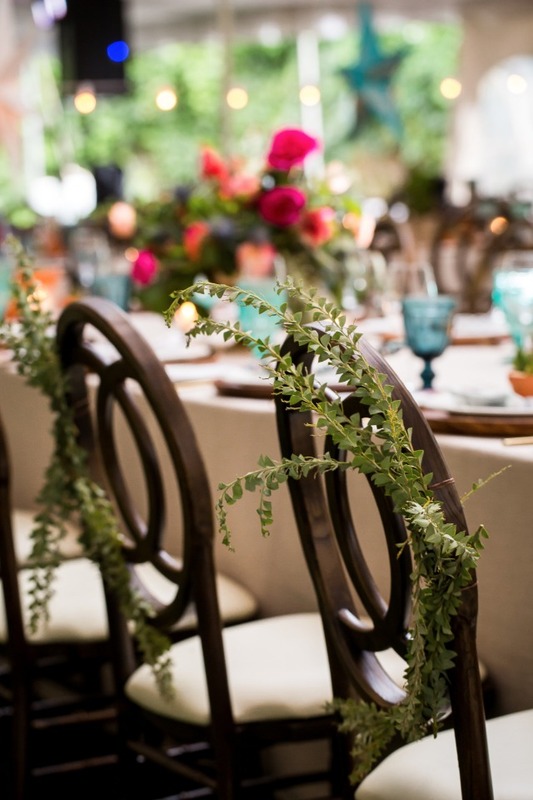 A family style meal of local farm to table dishes included heirloom tomato salad and grilled flank steak, garnished with flowers and herbs from the chef's personal garden. 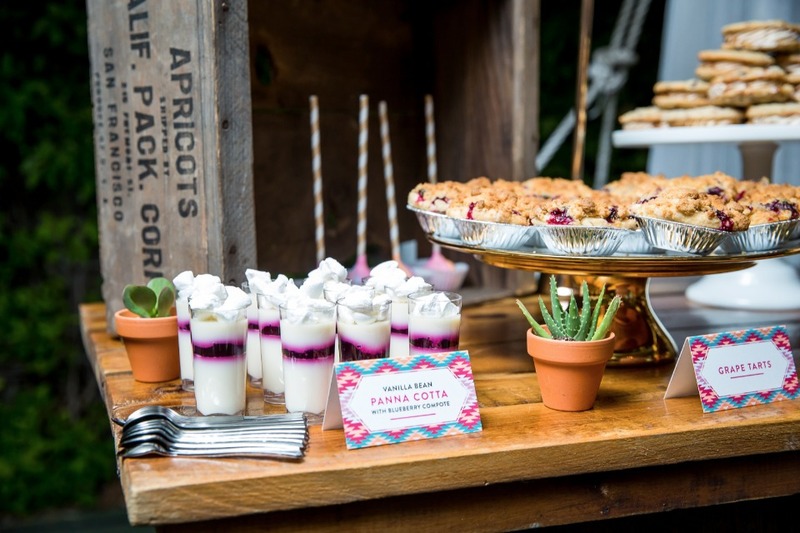 Regional treats like grape tarts, butter tarts, and cookie sandwiches were served on a sweet table. 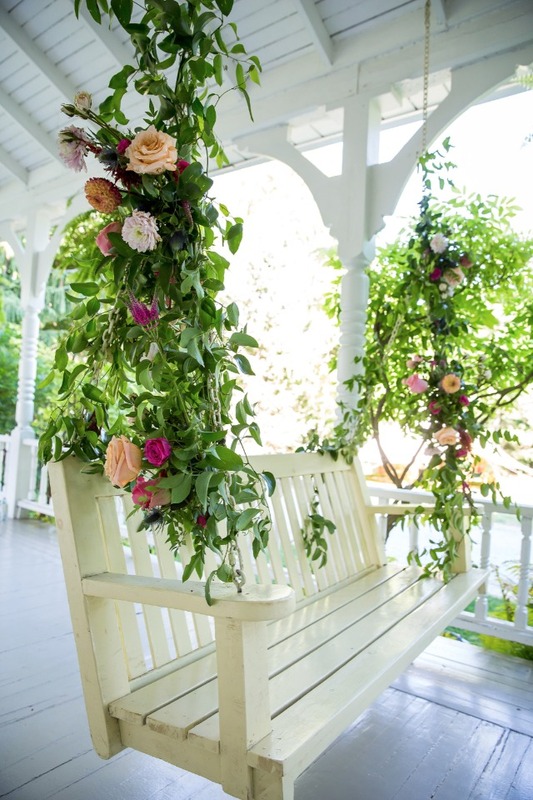 From Caroline: Really focus on what matters, and try to let the rest fall away so you can relax on the big day. Also get a special pair of comfortable shoes to change into for dancing! 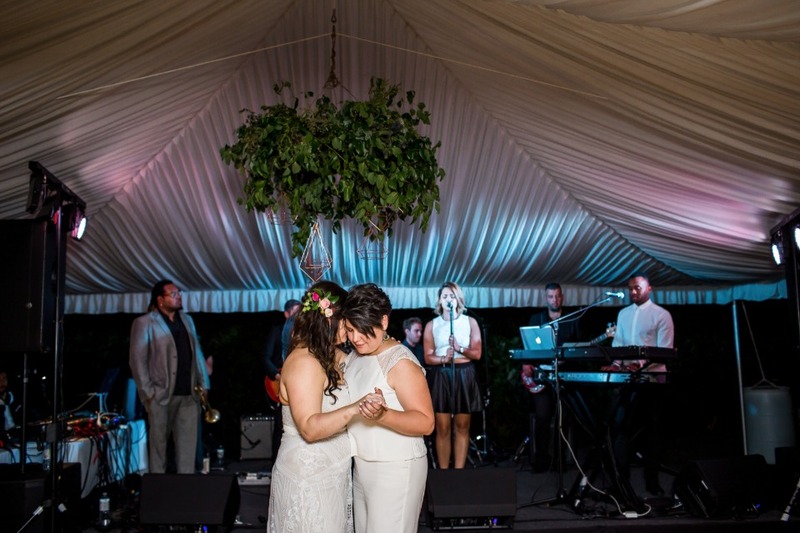 From Lustre Events: The band actually blew everyone away before we moved to the wine cellar for the after party where one last surprise of a poutine bar was ready to get all the dancers recharged! It was hand to heart one of those weddings we will be able to close our eyes and go back to in an instant for all time. 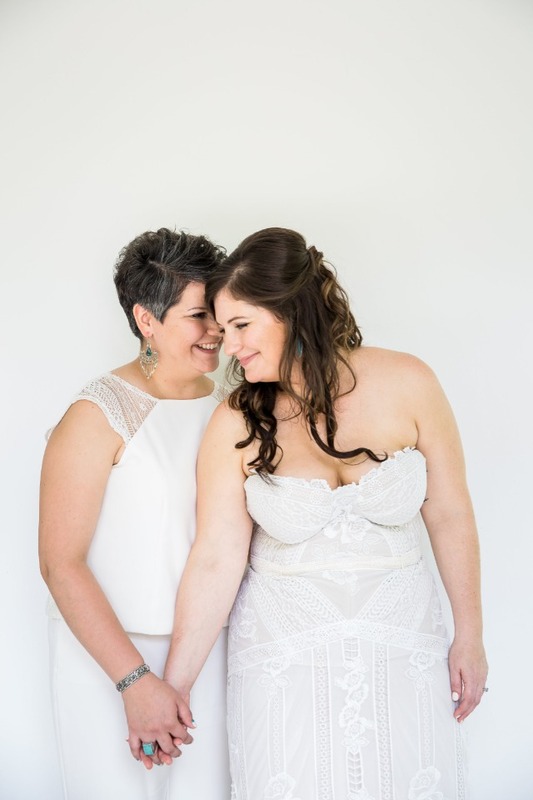 Caroline and Cheryl's wedding was the happiest of occasions where figuratively and literally all the stars aligned to create an unforgettable day filled with so many memories we can all be grateful for!